The federal government could begin requiring fishermen to register and eventually pay fees for fishing in federal waters.Ed Freitas, second from left, hoisted and secured a 373-pound marlin that he and the crew of the Brittney Lei caught during the Ahi Fever fishing tournament held yesterday from Waianae Boat Harbor. Several fishermen expressed anger yesterday over a federal government's proposal to register recreational anglers and spearfishers to fish in federal ocean waters off Hawaii. The public can comment on the proposed rule change for recreational salt water fishing until Aug. 11. John Boreman, Director, Office of Science and Technology NMFS, 1315 East-West Highway, Silver Spring, MD 20910 Attn. : Gordon Colvin. Comments can also be submitted electronically at www.regulations.gov. Recreational anglers and spearfishers will have to register and eventually pay $15 to $25 for a license to fish in water 3 to 200 miles off shore, according to rules proposed by the National Oceanic and Atmospheric Administration. The saltwater fishing registration would begin next year, but fees will not be collected until 2011. 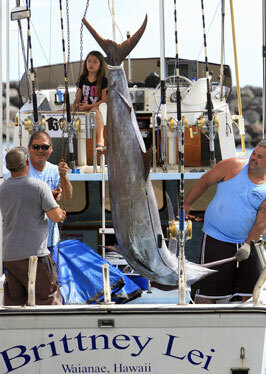 Recreational fishermen hate the proposal because they believe the license fees will go up and the information could be used to set limits on fishing, said William Aila, Waianae Small Boat Harbor master. NOAA said the proposal will improve the quality of information collected from marine recreational fishing and measure the effect of recreational fishing on the economy. It will also satisfy the recommendation to create a national database of saltwater fishers. "The national registry of saltwater anglers is the key to closing a major gap in information on recreational fishing," said Jim Balsiger, acting assistant administrator for NOAA's Fisheries Service in a news release. "It will help us conduct surveys to get a more complete picture of how recreational fishing by an estimated 14 million people is affecting fish stocks. This will lead to better stock assessments and more effective regulations to rebuild and manage these valuable fish." fishermen are doing, there's something wrong with that." At the Ahi Fever fishing tournament in Waianae yesterday, several participants complained the rule would mean more regulations. "If they try to charge recreational fishermen for the damage that the commercial fishermen are doing, there's something wrong with that," said Charles Escue, captain of the 25-foot Janie Maru, which caught a 152-pound ahi yesterday. "It's all about getting more revenue and more money to pay for other stuff." James Naylor said because of gas prices he can only take his family out on his 21-foot boat three times a year. On top of $200 in fuel per trip, he pays for ramp fees, a $60 annual boat license, and gas to take his boat to the harbor. "Why should I have to pay for a license to go out there with my family and catch small fish," he said. "I wouldn't be too happy," said George Kea, captain of the Kiyoko, which brought in two ono. "It's silly they even think recreational fishermen are damaging the fish stock." Recreational fishermen catch only a handful of fish on one trip, while longliners sometimes haul in 60,000 pounds a trip, they said. "They got to make more strict laws on the longliners. They're trying to put all their slaughtering on us," Kea said. Native Hawaiians would be exempt from the paying the licensing fee, NOAA said. The federal license would not apply to party, charter or guide boats, commercial fishermen and others who are already licensed. NOAA said the registrations will include an angler's name, address, telephone number, and the regions fished. The information will not be made public.